Kenya, officially the Republic of Kenya, is a country located in Eastern Africa. Kenya is north of Tanzania, south of Ethiopia, east of Uganda, west of Somalia, south east of South Sudan. The climate of Kenya is warm and humid, as it's close to the Indian Ocean. Kenya covers an area of 224,081 square miles, and is the 47th largest country in the world. Mount Kenya (the second highest mountain in Africa, after Kilimanjaro in Tanzania), at 17,057 feet, is the site of glaciers. 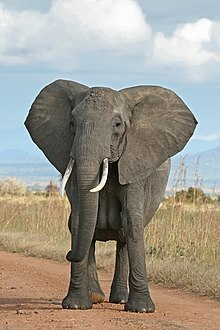 The most famous Kenyan wild animals are lions, baboons, elephants, giraffe, crocodile, and buffalo. Zebras may be found in Kenya as well. Nairobi National Park started the year 1900. is a reserve for many wildlife species in Kenya. The National Park is close to the capital city of Kenya, Nairobi. The unique ecosystem has several vegetative, such as open grasslands with permanent rivers. Manmade dams at the park have been a favorite habitat to many species of birds. Some famous wildlife in this park are the Black rhino, lion, leopard, cheetah, hyena, buffaloes, Giraffe, zebra, wildebeest, elands and diverse birdlife, with over 400 records of species. This park covers an area of 117 Kilometers, and throughout the months it's very warm/hot. Fort Jesus, a fort built by the Portuguese when Portugal settled in Kenya (1953 - 1956), is an outstanding historical site (UNESCO set Fort Jesus as a historical site) for learning about Kenya's ruling under Portugal. It shows how the Portuguese defense was back then, you could even compare it to 1950's Portugal defense to current day Portugal defense! This fort includes the surroundings, and covers an area of 2.36 hectares. This page was last edited on 21 November 2018, at 00:20.